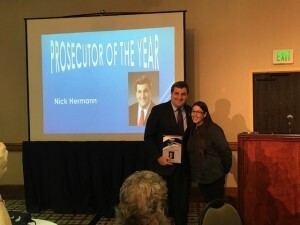 Elected Prosecutor of the 1st Judicial Circuit of Indiana in November of 2010, Nicholas Hermann has practiced as a trial lawyer for over 13 years. His diverse trial experience coupled with innovative strategies to streamline the Vanderburgh County Prosecutor’s Office, has yielded new strategies to punish those who tax our criminal justice system. The goals of the Vanderburgh County Prosecutor’s Office are to put violent criminals behind bars, rehabilitate those who have fallen through the cracks, and instill a sense of justice for victims who were thrust into the system. After being sworn into office in 2011, Hermann immediately restructured the criminal case alignment to a “Vertical Prosecution” method. Once a case was assigned to a particular attorney, that case would stay with that attorney until the conclusion. Hermann also substantially increased targeting habitual offenders. Prosecutor Hermann and his staff brought WeTip to Vanderburgh County in 2013, a nationwide initiative for anonymous crime reporting. In 2018, Officials with WeTip recognized Vanderburgh County Prosecutor Nick Hermann with the “Prosecutor of the Year” award. The Vanderburgh County Prosecutor’s Office was also recognized in 2014 with the or ganizations’s highest honor, the National Safety Award. The Vanderburgh County Prosecutor’s Office leads the nation in crime-fighting tips. Prosecutor Hermann earned WeTip’s “Man of the Year” award in 2016, bestowed upon a prosecuting attorney going above and beyond to help solve crimes in the community. Hermann was elected to several boards and committees within the Indiana Prosecuting Attorneys Council. Hermann currently serves on the Legislative Committee, which oversees upcoming legislation crucial to the Indiana criminal justice system. 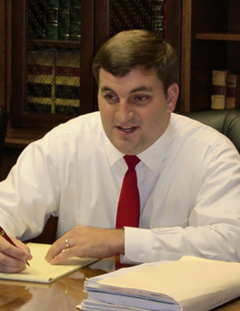 Hermann also serves on the Ethics Committee which advises prosecuting attorneys on ethical issues. In 2015, Hermann was selected to speak at the Indiana Prosecuting Attorneys Council Summer Conference on “Prosecuting Tools for Reducing Recidivism”. In 2016, Hermann brought together health professionals from across Indiana to host the “Vanderburgh County Drug Symposium” focusing on drug rehabilitation programs, trends in drug trades, and personal testimonials from those in the grips of addiction. In May of 2017, Indiana Attorney General Curtis Hill selected Hermann to serve on the Attorney General Public Safety Coalition, highlighting drug abuse programs across the Hoosier state. In June of 2017, Hermann earned the prestigious honor of being selected to serve on the Indiana Supreme Court Committee on Rules of Practice and Procedure. The Vanderburgh County Prosecutor’s Office handles over 3,000 felony cases, over 5,000 misdemeanor cases, over 13,000 infractions, and nearly 12,000 child support cases every year. Hermann and his staff of deputy prosecutors work in conjunction with judges from the Vanderburgh County Drug Court, Mental Health Court, Veteran’s Treatment Court, and Pre-Trial Diversion for low level felony and misdemeanor offenders. Having deep roots in the community, Hermann and his family are proud to call Evansville home.